Wency discovered Pilates when she walked by a Pilates studio in her local gym and wondered what the people were doing on these strange pieces of equipment. After walking by the studio a few more times, she signed up for her first class and was instantly hooked! She credits Pilates for an increase of strength, flexibility, coordination, and balance, but also for enhancing her mind­body connection. 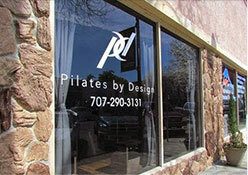 In June 2012, Wency went through Body Arts and Science International Pilates Apparatus Certification Program. She is looking forward to sharing her love and benefits of Pilates with you!